PRESS RELEASE: Taye Drums has been making great drums at a price that will not hurt your bank account, but we decided it is time to tell you about our hardware. Our hide away boom arms give you options that you do not have with a standard boom cymbal stand. 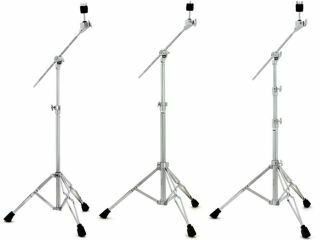 Taye offers the medium weight, BS5200HBT, and heavy duty BS6200HBT & BS6300HBT cymbal stands. With these you can have a standard straight stand with the 12.7mm boom arm tucked into the height extension tube or you can get your ride cymbal in just the right spot extended over the tom or out to the side. If you want to get crazy you can get your ride cymbal up like Erskine did back in his weather report days. These are great cymbal stands that simply get the job done with options. Who could ask for anything more?